A unique contemporary cabin in the forest with a simple interior. These days, we usually see modern homes made up of straight lines and geometric shapes. For most homes, rectangles are used because it provides more space in the interior and it looks simpler when decors and furniture are added to it. But aside from this four sided shape, triangles as well as curves are also favorites when it comes to designing a home’s architecture. Aside from the home’s exterior, the interior is also one thing that differs from every home depending on the size and shape of the lot as well as the owner’s design preference and lifestyle. 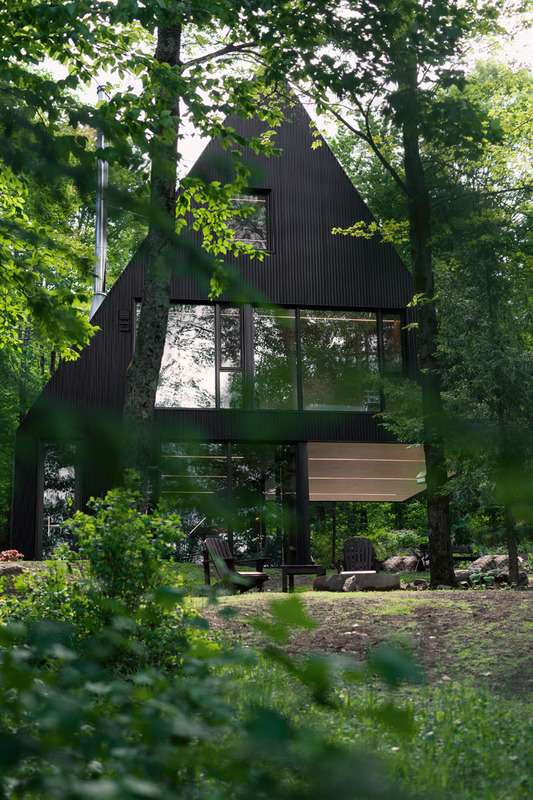 This black contemporary cabin home with a Hemlock forest around it is located in Quebec, Canada. This cabin is designed for a couple of young professionals who have two children. It is designed by architect Jean Verville resulting into a beautiful home in the forest. If it looks very experimental in the exterior, it looks a lot simpler in the interior with all important areas needed in order to have a comfortable living. The cabin is tucked away into a slightly sloped lot which makes it a bit challenging to design but of course, despite that, they were able to come up with a beautiful home design with a well distributed space in the interior. Let us take a look at the house below. 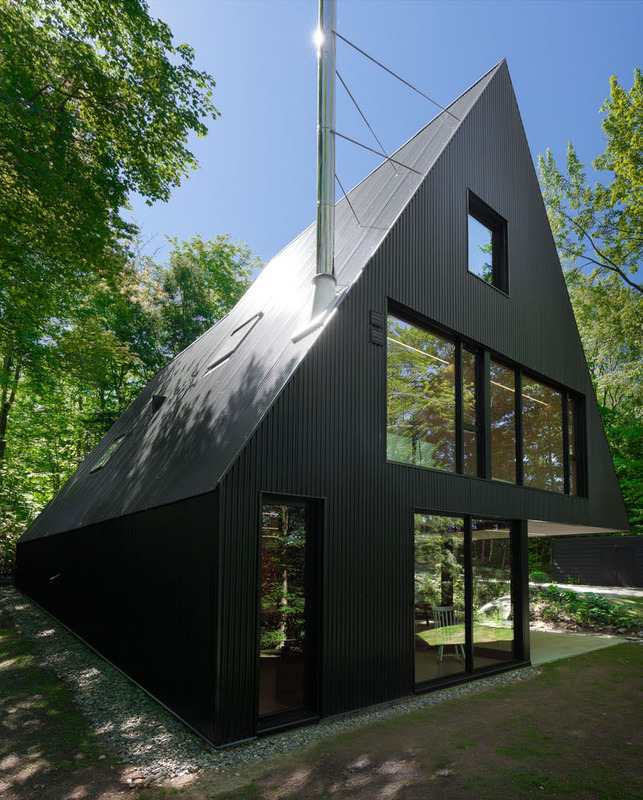 Unique feature: A unique contemporary home with a triangular design featuring an attic. At first glance, you might think that this house is made for a movie or something because of its unique design. It does look a bit creepy at first because it is tall and triangular in shape, and it is colored black as well. Its location also adds to the drama but once you get to see what is inside, you would change your mind. Here’s a view of the sides of the cabin. 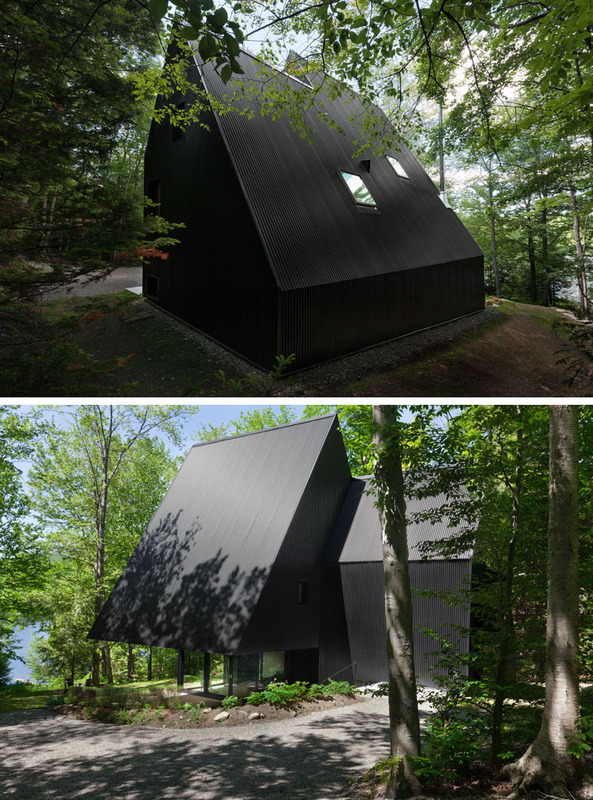 You can see that the black cottage has a sloping roof line that is surrounded with a Hemlock forest. For sure, you will agree with me that the design of the cottage is indeed unique from the usual homes that we see. You can see in this angle that the house indeed have a unique shape and it is all black which makes it even more unique. Its location is also a plus factor for the appeal of the homes. Seen here are exterior steps that lead down to a terrace which is covered by the cantilevered overhang. You can also see here a table with built-in bench which is a nice spot to have a picnic with family and friends. On this part of the house, sliding glass doors with black frames are used for both sides of the living area. You can also take a glimpse of the living space here where there is an eclectic mix of furniture and white walls. 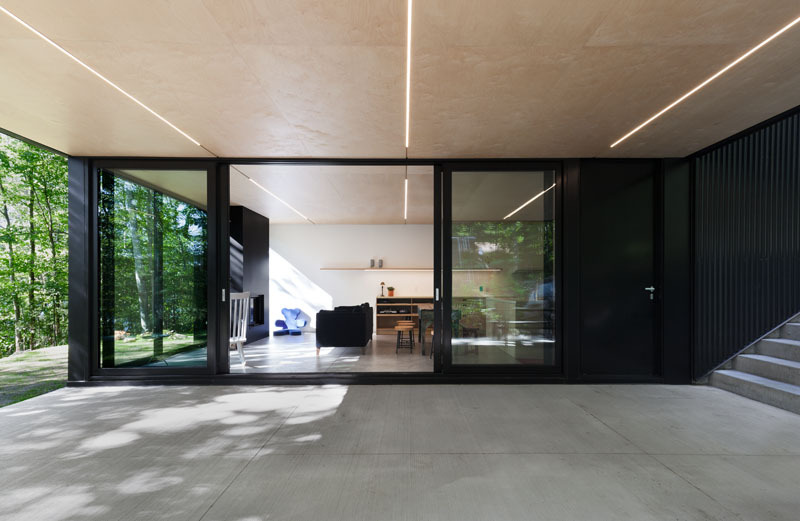 The overhanging exterior ceiling and lighting flows through to the interior of the house which is a good way to unite the spaces. 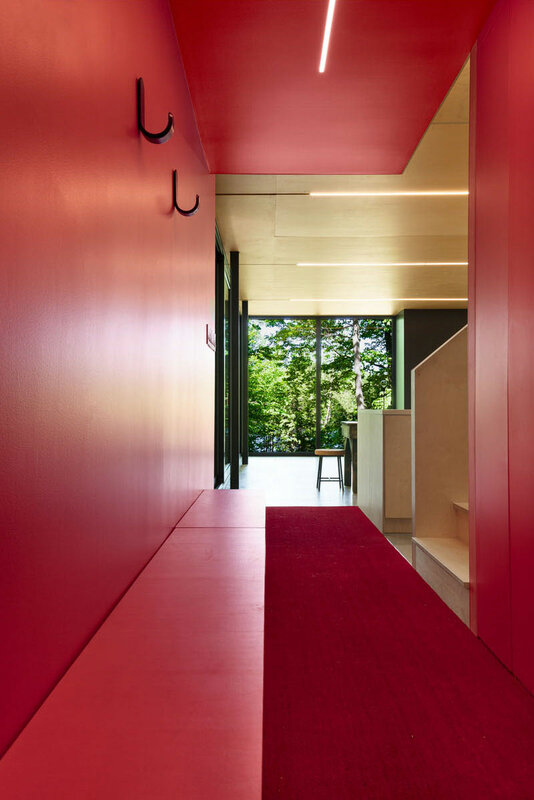 Aside from black and white, you can also see other colors in the interior like the red walls and ceilings on a hallway. You can both see here the kitchen and the natural landscaping. There is also a bright red space in the home that is designated for hanging up coats and taking off boots. For sure, one would hesitate to bring muddy boots in here because aside from its bold colors, the flooring is also clean and it has a long red area rug. 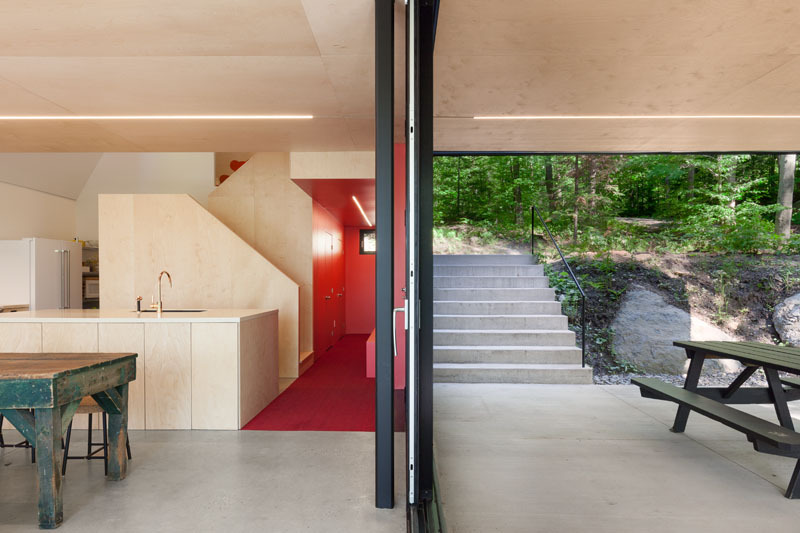 On the main living level of the house is a kitchen, dining room and lounge. In the dining area, it has a wooden dining table and a long red bench- both brings a rustic feel to the home. 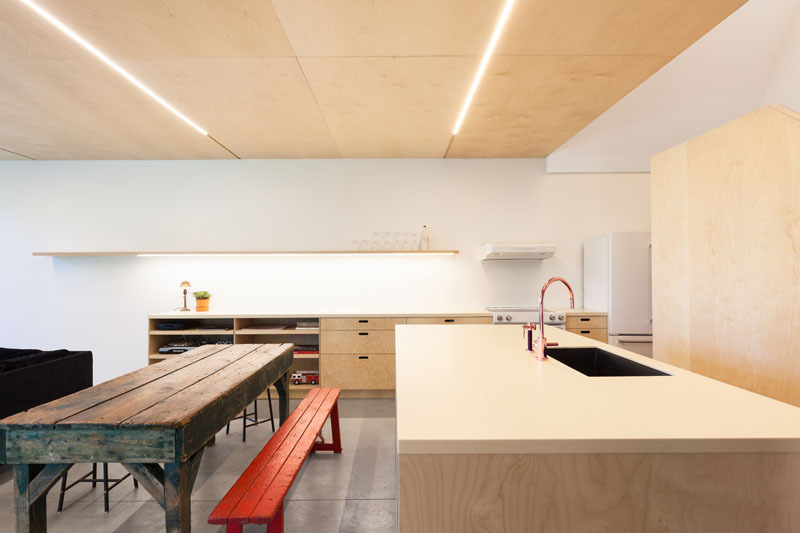 The kitchen has been kept simple, and a shelf along the wall hides additional lighting. Behind the kitchen are the stairs that is made from light wood. It also connects to another staircase that is painted in white. 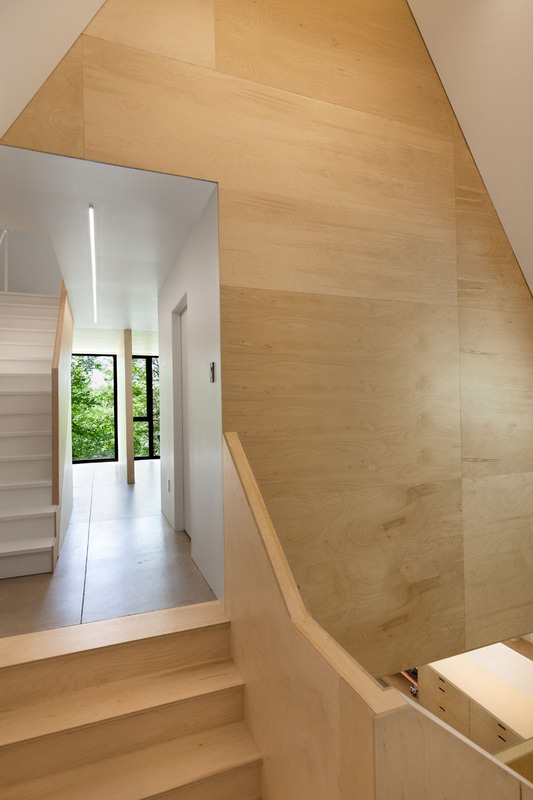 This stairs lead to the upper floors of the home. In the kids bedroom, it has a lofted play space that can be reached via the shelves that also double as a ladder. And yes, the lofted space is that part where you can see a pair of legs pointing up. Trippy, right? The bedrooms upstairs used a simple color palette of white. The parents’ bedroom and bathroom both features large windows that allow plenty of natural light in. Aside from that, it also frame the surrounding forest. There’s also a second bathroom with a window for added light. Just off the sleeping areas, is another set of stairs that lead to the attic. 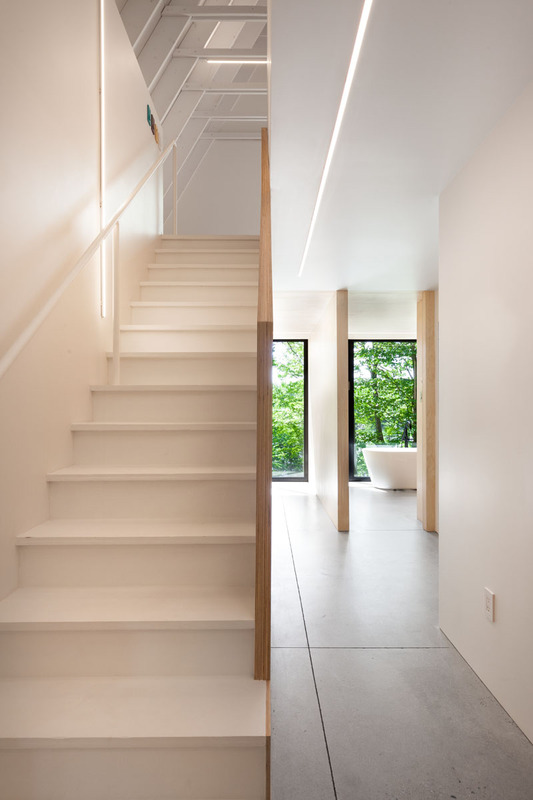 Notice that this staircase is white in color with painted steel as railings. 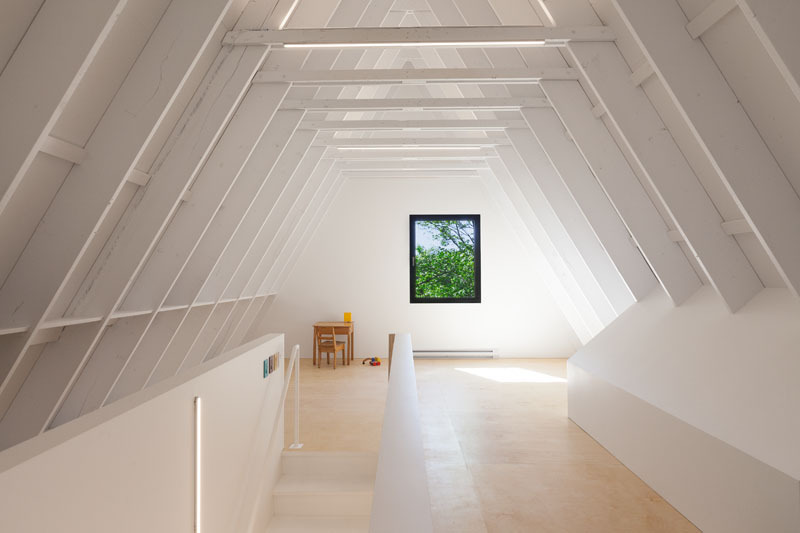 In the attic, you can see exposed beams painted in white and a lone window with a black frame. In here, there is plenty of space for the children to play. Now this is the bathroom with black and white colors. 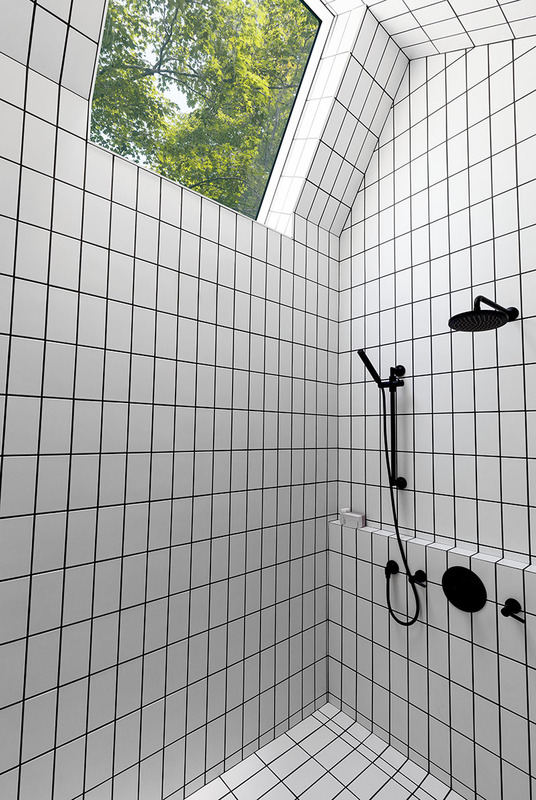 Black tile grout was used for the white tiles giving it a grid classic look. It also used black bathroom features as well. 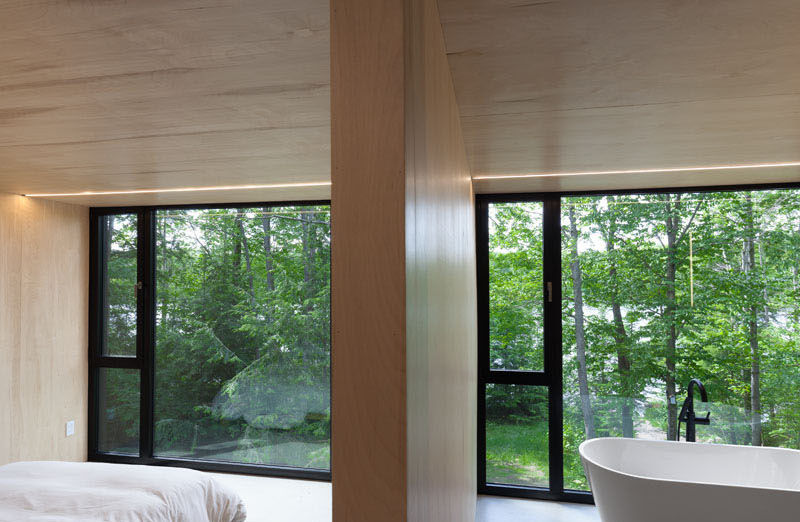 And like the other spaces, it also has a window that allows a view of the forest and it could let natural light in. Unique, right? It sure is. 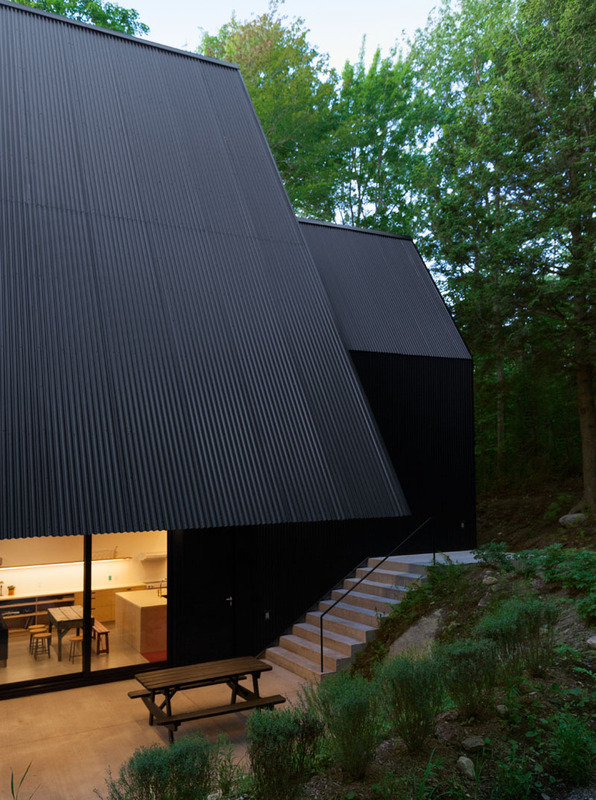 This house designed by Jean Verville may look really distinct in its exterior but if you get inside, you will see that it is just like out homes with a kitchen, living area and all. But because of its unique architecture, the interior design has a different layout too. I like how the designer properly distributed the spaces in the interior and how it managed to use both neutral and bold colors together. The environment around the home is pretty pleasing too. How about you, what can you say about this house?